It seems we’re travelling with ever more travel gadgets these days, all of which need to be recharged in a hurry, especially when some of them won’t last a day on a charge. At least, it’s good to see equipment standardisation – especially when it comes to power supplies. Do you remember when Sony Electronics was wing back in the 80’s and 90’s? You had to travel with a different and unique power supply with proprietary AC power tips for every single product they made, which meant travelling with an extra suitcase just to hold the power bricks for all your stuff! Thankfully, the recent trend to standardise power over USB is a great break from the past. Many MP3 players, portable cameras, portable modems, rechargeable batteries, etc, support this interface for recharging, so now you only need one recharger. Bear in mind that most USB cables made for power recharging DO NOT also support data synchronisation. If you want your cables to do both, then you will need to purchase data synchronisation cables (that will also support recharging) and, most likely, they will cost you a premium. Lightning cables for iOS products don’t have this problem, which explains why they are always so expensive! They can always be used to sync and charge. Unfortunately, USB isn’t a one-size-fits-all solution. There is micro-B, micro-AB, Mini-A, Mini-B and Type A (to name a few). If you want to know what kind of USB connector your equipment has, consult the Wikipedia page. It has a comprehensive description and illustration of each. This means that you may have to carry around several different USB cables but you don’t need more than one USB power adapter. Better yet, carry around an octopus cable that has multiple tips. What to Buy – Amps, Volts… Watts going on? To make things even more complicated – not all USB power adapters are built equal. Different devices offer different amounts of power. Some offer fast charging, whereas others just a trickle. Not every port on each device will offer both. You need to pay attention to the amount of amps and wattage that the equipment can offer across all of its ports AT THE SAME TIME. iPads and other tablets will take an eternity to charge, if you are not using a rapid-charging port that offers at least 2.1 amps at 10 watts. Ideally, you want a device that can offer 2.4A on EACH AND EVERY PORT ALL AT ONCE. For example, here’s a common marketing trick. The manufacturer will say “8A on 4-ports” and “2.4A per port”. If you do the math, that isn’t 2.4A per port. How can they get away with that? Because they are saying two different things that aren’t mutually exclusive: (1) the device will share 8A across 4 ports, and, (2) will provide a maximum of 2.4A per port – but not all at the same time, depending upon what you’ve plugged into it. As soon as you start plugging in devices, it will drop down the amount of juice available to each port, because it has an 8A maximum to go around. In the early days, USB chargers made a distinction between trickle charge (500 mA) and rapid-charge ports (2.1 A). Nowadays, most devices use intelligent switching to determine what device is connected and will supply the amount of power required to recharge it as rapidly as possible. DO NOT bother with devices that still label ports. This is fiddly and annoying. Makes sure that the device you are using can supply 2.1 amps and at least 10 watts across every single port. For tablets and smartphones, you want 2.1 amps at 12 Watts in order to get rapid charging, otherwise you’ll be waiting a long, long time to recharge your device. As for cables, you would be wise to take several different kinds and multiples of each. Not all cables are of similar build quality and signal quality affects performance. This is less true of power recharging, but if you use the same cables for data transfer, you may find that better cable results in better data throughput rates. This posting, however, focuses solely on power, so we will save the issue of cable quality for another post. The usb rechargers featured here do not include a battery. They are designed for people who are always near a power source. Are you looking for USB External Battery Chargers? Yes, the Unitek confirms that there is an altar that we can pray to whenever we need maximum fast charging for all our travel gadgets at once. Quite literally, you can place your devices on the power altar and have them all charged at 5V 2.4A per port! Yes, that’s 10 tablets fast-charging at once. This is what nerd-vana looks like to the power USB enthusiast, travel gadget freak, or for the USB Brady Bunch – a usb power strip with 8 ports at 2.4 amp, 12 watt each!! With this puppy, you can recharge 8 x iPads at once! Now, you just have to figure out where in the house to put it, so that everyone can plug in and get their juice. I suggest the bathroom, since that’s probably the only place where every convenes in a household with so many personnel-avoidance devices. DON’T BE FOOLED BY OTHER CHARGERS! They don’t have 2.4 amps on EVERY port. This is crucial. NOTE: This is not going to be your best usb travel power strip, reason being that it comes with a HUGE power brick. The actual size of the recharger is small – it fits in the palm of your hand – but the power brick dwarfs the usb charger and you’ll have to carry that around in order to plug it in. 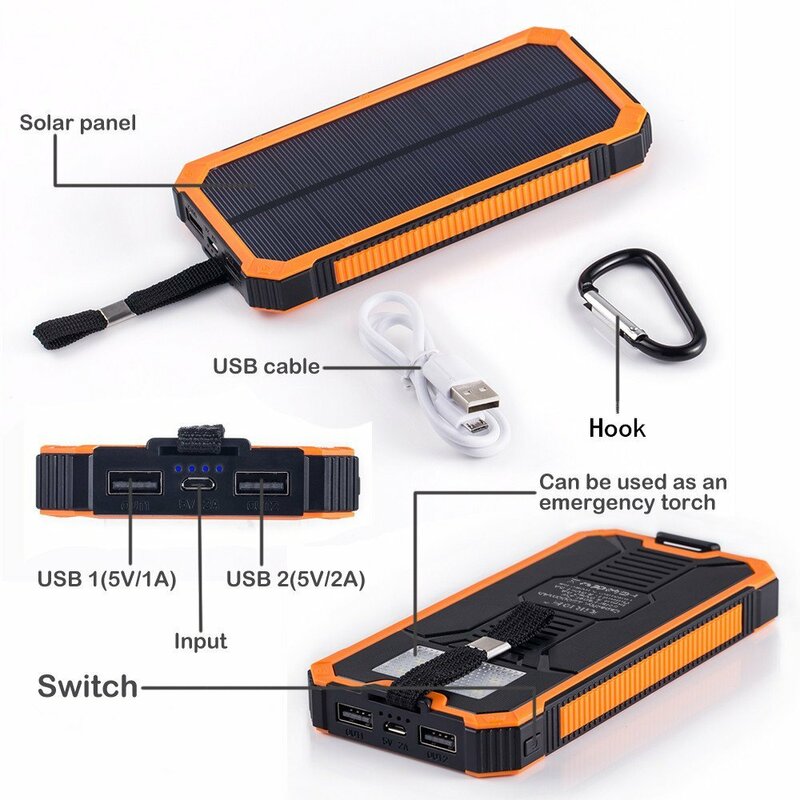 Thankfully, the power brick switches voltages (100-240v), so you can use it around the world. But, that said, this is not an ultra-portable power adapter! If you want something that packs better, check out the Anker at Number 2, below. This is a nifty-looking Kickstarter launched USB recharging device that offers fast-charging with 8-ports at 2.1 amps per port at 10 watts, rated at 16.8A/84Watts overall, so it’s a little shy of what the EZOPower can offer in terms of pure power. Nevertheless, you might like the UFO saucer shape of it. If you use very short cables, you might find it looks less like a spaghetti-junction than the EZOPower. It’s up to you. We’re big fans of Anker but this product is misleading. It touts itself as having 2.4 amps per port but only shares 60W across all 10 ports, which means that your devices can’t fast charge if you put more than 6 thirsty ones on at once. We’re including it here, though, because it is the smallest 10-port usb recharger that we’ve come across and, also, some people may not want fast-charging! Yeah, that’s okay, too. If you want fast-charging across all ports, though, get the 10-port Unitek (above) or the Anker 6-port (next). After the EZOPower here’s our next recommended usb power recharger: 6-ports at 2.4 amps each, or with 12 amps overall and 10 watts per port. With 2.4 amps per port, you can comfortably fast-charge 5x iPads simultaneously. Also, it uses a female kettle plug, so you can purchase different leads for different countries – without having to use cumbersome adapters. Yes, it is dual voltage, so you can use it anywhere. And it doesn’t require a separate power brick – all of the electronics are built into the main unit, which fits into the palm of your hand. Finally, it’s lightweight. It may not be the smallest usb charger in our line-up but it’s the best compromise over-all for size, weight, number of ports, price, power and fast-charging support. So, don’t buy the 10-port, unless you don’t mind the extra 4 ports used to trickle charge your Apple pencil, or something. The Anker 6-port really is the best all-rounder, portable USB that we’ve come across. Even though these guys don’t know how to spell ‘energy’, they do know how to design a clever mains/battery recharging product. You get 5 ports with 2.4 amps on EACH (well, done; these guys get it) and one of the ports is actually a pull-out 3200mAh battery, which you can take with you on the road to recharge on the go. Just slot it back into the unit when you return and it goes back to functioning as one of the 5 recharging ports (while recharging itself). Genius! It also has a built-in cable tidy, which is nice, so your recharging station doesn’t end up looking like spaghetti junction. Very thoughtful. Where is the Smallest 10amp USB Charger with folding prongs???? 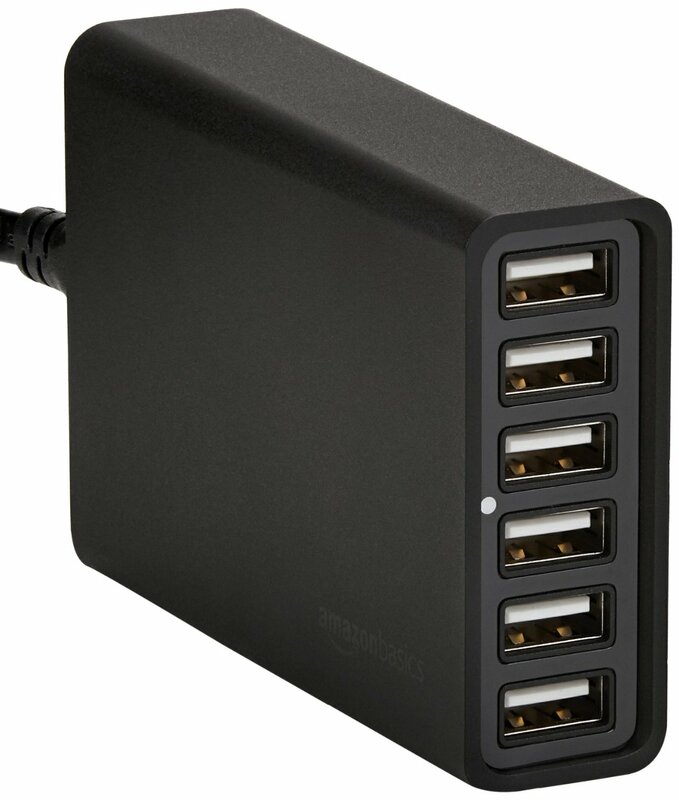 I take a moment, here, to just ask the question – if we can send a man to the moon, why can’t we have a 4-port usb charger with at least 2.4 amp on EVERY port and not shared across all? I know, I know… engineers will tell me it has something to do with the size requirement of the power transformer somehow fitting into a palm-sized device, etc, etc, and that it might involve Donald Trump’s candidacy, or some other conspiracy theory. The fact remains. I cannot for the life of me find a 10amp 4-port usb charger!! If you come across one, please drop us a line. In the meantime, here’s a list of the best 4-port usb travel chargers I can find. Still, here’s what it has going for it. It can recharge devices 4 devices with the total power requirements of 2.4A + 2.0A + 1.8A + 1.8A. That would look something like this: iPad, iPad mini, Phone, Phone. And – it has foldable (retractable) power prongs! This has similar specs to the iClever BoostCube, above. Just a less known brand but who’s to say it’s any less of a product. Most of these are probably white branded and come from the same Chinese manufacturer at the end of the day. This has exactly the same specs as the other two usb chargers (above), except without the folding power prongs. Instead, it uses a female power lead that plugs into the end. Frankly, this is much better for international traveler, because they can use whatever power lead they need (with appropriate wall plug) without having to carry a bulky adapter with them (the RavPower does accept 120-240V, so it can be used anywhere in the world). This one, sadly, is often out of stock. Still, click the link, because you might find it available from other sources. The Skiva PowerFlow QuadFire is a small 4 amp usb charger with foldable prongs (US). It is smaller, therefore, than the PortaPow, but it has a little less power to offer (4 amps vs 4.5 amps). Also, like the PortaPow, it shares the 4 amps across all the ports, so you will end up trickle-charging, not rapid-charging, your devices when you add more than two thirsty ones at once. I am one of those lame people who travels with two iPads. I know. I use a large iPad Pro with keyboard as a laptop replacement and a small iPad Pro as my reading device. I tried using a Kindle Fire for a year but its slow and buggy UIX drove me bonkers. What this means is that I have to charge two thirsty iPads at once wherever I go. The Anker Dual USB recharger is the smallest usb charger of the bunch that provides this much fast-charging power to both devices. It prongs fold down and it fits in your pocket, making it the smallest usb travel adapter. Not as svelte as the XtremeMac, although the prongs do fold down flush with the unit. As you would expect, this offers 2.1 amps across both USB ports simultaneously – so, yes, you can recharge two iPads or tablets at once. The Vinsic doesn’t have prongs that fold away and it’s a little under-powered at only 12W across two ports. Nevertheless, it’s good value and one of the smaller usb rechargers (although not the smallest usb charger). This charger has a pop out car port plug along the top and fold out mains prongs on the rear, which means that it can be plugged either into the cigarette lighter port of the car to charge two of your travel gadgets USB devices at once, or plugged into the mains when you get back home. The only caveat is that it is 2.4A across both ports and not 2.4A per port. Well, you can always live in hope! We interrupt this post to discuss car port chargers, now that you’ve read our entry (above) about the Dreamsky. Frankly, there are tons of car port usb rechargers flooding the market and you should only concern yourself with the ones that support 2.4 amps per port. Also, we purchased the Aukey and PNY and recommend that you DO NOT. Why? Because they are so small that they often end up getting stuck in the cigarette lighter and there’s no way to pull them out, because they don’t have a big enough head on them. We had to abandon both of them in rental cars, because we were in a hurry to catch flights and the darn things were stuck fast. So, do yourself a favour and get a usb car port charger that you can get a good grip on, even if that means it’s a bit bigger than you’d like. While none of the 4-port USB wall chargers that we came across can support 10A at 2.5v across all 4 ports at once, we did find such a thing in the Car Charger department. The Focustech and DBF both do 10A at 50W, so you get 2.4V per port across ALL ports SIMULTANEOUSLY! Okay… that’s 7 products… but we have a few more for you to consider…. While this product is sold primarily as a travel power strip, it also has 2 USB ports with 500mA on each port. This is not fast-charging, so take note. It’s really a power strip with the extra convenience of trickle charging two devices at once. The power prongs on the unit can swivel into different positions, so that the unit can be mounted off the wall in different orientations. Alternatively, you can bring a retractable power cable with you, if you find it difficult to mount this unit directly onto the wall. This is often the case in some hotels, where skirting, mouldings, or other architectural features get in the way of the socket. We would even advise our UK and European travellers to get one of these, too. The reason being that US plugs are smaller than most plugs in other parts of the world and, therefore, standardising your entire electronics kit onto the US cabling system makes a lot of sense. For example, you can change all of your laptop AC mains cables to US ones (since most power bricks are universal, supporting different voltages from around the world). Then, you simply carry this power strip with you to service all of your equipment. Your equipment will be lighter and take up less space. Plus, you won’t have to remember which cables to take for what; just keep everything ready to go for travel in the same small bag. REMEMBER, though, use it with a step-down transformer and do not plug this into a non 120V outlet!! It has a fuse inside that will blow, because it’s not rated for anything higher. I blew mine out in a British hotel to the smell of burnt toast, because I had forgotten (in my groggy state) to consider that it wasn’t dual voltage. It’s a bit chunkier than the competition but claims to have super fast charging for a range of phones and tablets. Read the specs to see if your device is included. Basically, this is a portable battery pack with fold out prongs to plug it into the mains and has two USB outputs. Both USB ports a 6,000mAh battery that offers 2.4A across both ports. If you travel a lot in the UK, get yourself a UK/US power adapter plug. Personally, I do not like the ones that attempt to be the Swiss Army Knife of adapters, because they are bulky, fiddly and sometimes have pieces that can get lost (like the ones that had the detachable usb recharger port). Instead, I’d get a very simple design with UK prongs on one side and a receptacle on the front that can accommodate any prong design. There are many on the market. I’ve chosen one, below, to get you started on your search. Uh, thanks Steven for your contribution but doesn’t this seem to be a bit off-topic? I mean, you’re commenting about travelling in Europe in a post about USB Power Adaptors. Correct me if I’m wrong but you come across like a spam bot dork. If you are human, then feel free to set me straight. I dare you. Lot of choices for one to pick around. Lenmar 6-Port USB Powerport Hub is something I brought few days ago. It will warn anyone that it has a blue led light that glows constantly when the device is plugged in. Thanks, Dension, for that information. It is annoying sometimes when they have bright lights glowing at night in your hotel room, so this is helpful! Universal adapters are the way to go. I have this one from Amazon and it is amazing. I like the graphic of all the flags on one side. Very cute and, hopefully, useful, too!